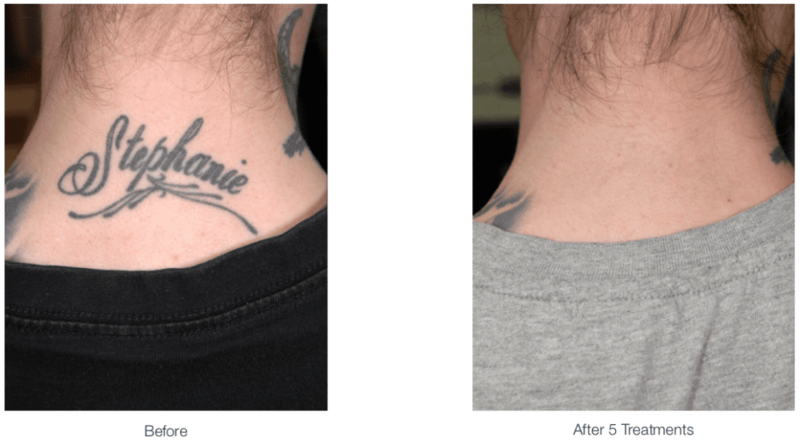 Laser tattoo removal – Two cutting edge technologies are combined to clear more color in a faster treatment. This means better clearance, fewer sessions, and less ghosting than with other systems. So erase what you need to! 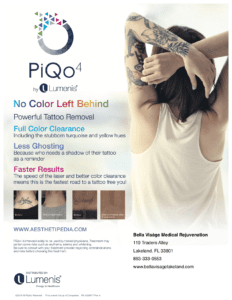 Download this PiQo4 Tattoo Removal information sheet. 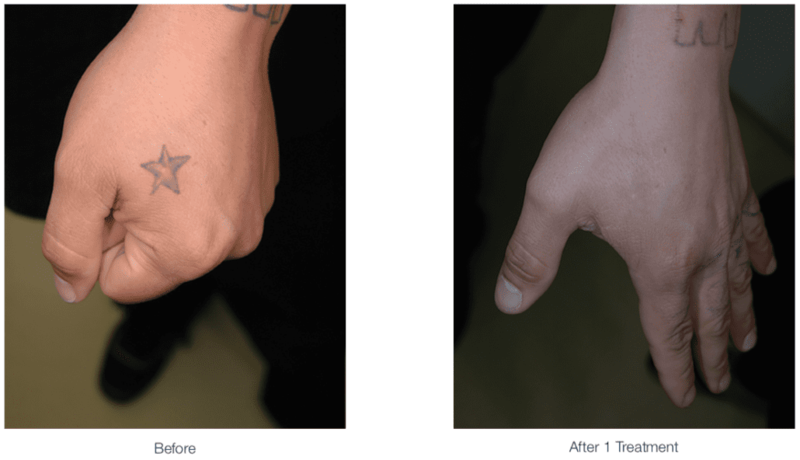 Laser tattoo removal – PiQo4 laser technology effectively removes all common color tattoos, whether amateur or professional. This new technology targets both large and small tattoo particles simultaneously, breaking them into tiny particles that are naturally removed by your body. The laser only targets the ink, and will not harm the surrounding skin. Because tattoo ink particles vary in size, previous technologies would break down either small particles or large particles, but not the two together. The versatility of the PiQo4 allows for precise treatment of varying particle sizes and tattoo colors. The number of treatments needed depends on the tattoo itself, the area of the body and the background skin color. For the most accurate estimate of sessions please call the spa or schedule an appointment with our Nurse Practitioner Jeanna for a free consultation. Location matters: The closer the tattoo is to the heart, the better circulation, therefore better results. More colorful tattoos and greater surface area usually require more treatments. Amateur tattoos are typically not as deep as professional ones and can be easier to remove. A treatment series can range from 2 to 10 sessions and are conducted 6-8 weeks apart. Immediately after treatment, you will see a whitish “frosting” over the tattoo. The skin will often swell in the area of the tattoo, accompanied by mild redness. The frosting, swelling and redness will resolve in a matter of hours. The tattoo may crust or blister as the body repairs itself. This will resolve naturally. The tattoo will fade gradually in the following weeks as your body clears the ink. Our Nurse Practitioner Jeanna will provide guidelines for before and aftercare, as well as the approximate time of the laser removal session. During your session, you will hear the laser fire as loud, audible popping sounds, then feel heat over the general area of the skin. The treated area will feel as if it were sunburned. PiQo4 laser tattoo removal treatments are not suitable for everyone and carries some risk. Persons known to form skin keloids may be more prone to scarring after any skin trauma, including laser administration to the skin. Persons with dark skin may be at increased risk of hypopigmentation (lightening of the skin). Hypo and hyperpigmentation are a common risk of treatment. Be sure to consult with our Nurse Practitioner before choosing this treatment. Pricing is for a single treatment. Treatments are spaced 3 months apart.